Sony is getting ready to introduce at least one successor to the Xperia XZ1 - most likely at MWC in February. The company's upcoming flagship smartphone has been rumored to finally adopt the bezel-less look that's been so popular in 2017, and a few days ago a spec sheet leaked for the Sony H82xx device. This will apparently come in four market-dependent versions: H8216, H8266, H8276, and H8296. 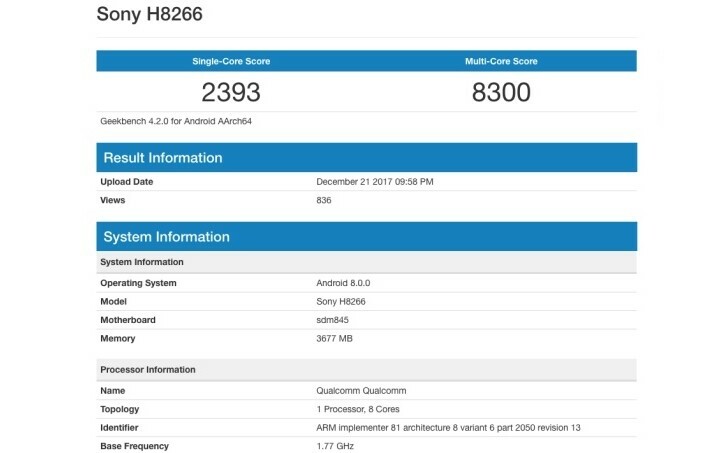 The H8266 has now been spotted in the Geekbench database, having run the well known benchmark. The listing confirms that at least this model will be powered by Qualcomm's Snapdragon 845, its premier SoC offering for next year. The Sony H8266 pairs it with 4GB of RAM and runs Android 8.0 Oreo. The phone achieved a whopping 2393 single-core score in Geekbench 4.2, and 8300 for multi-core. Those results are in line with what the Galaxy S9+ boasting the same chipset managed, and it looks like the 845 will not lack in the performance department. While Geekbench hasn't revealed anything else about the new Sony, past leaks had it coming with 64GB of built-in storage, two 12 MP cameras on the rear, and a 15 MP front-facing snapper. It should be kept running by a 3,130 mAh battery. Such trolls like like you should be report as spam, why moderators still sleeping?! Aaahhh music to my ears with thus Next Sony flagship cell.